Sen. Chuck Schumer (D., N.Y.) and Rep. Nancy Pelosi (D., Calif.) issued a statement Wednesday evening announcing a deal with President Donald Trump to make DACA law without building a border wall. However, the White House press secretary responded, insisting that no deal excluding a wall on the border with Mexico had been reached. 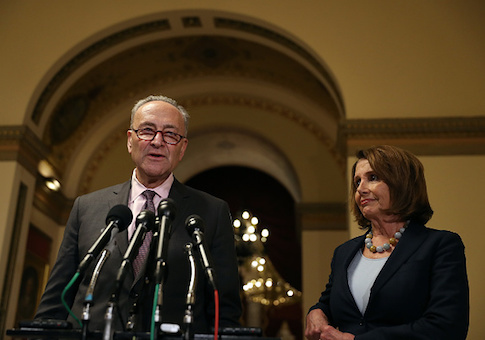 Schumer, the Senate minority leader, and Pelosi, the House minority leader, issued their statement following a working dinner with Trump, officially meant to address both DACA and healthcare legislation. "We had a very productive meeting at the White House with the President," the statement read. "The discussion focused on DACA. We agreed to enshrine the protections of DACA into law quickly, and to work out a package of border security, excluding the wall, that's acceptable to both sides." White House Press Secretary Sarah Huckabee Sanders subsequently denied the claim that no wall would be built. A wall on the border with Mexico was a key campaign promise of Trump's. "while DACA and border security were both discussed, excluding the wall was certainly not agreed to," she wrote. A White House press release otherwise called the meeting "constructive" and said that it focused on "tax reform, border security, DACA, infrastructure and trade." "The Administration looks forward to continuing these conversations with leadership on both sides of the aisle," the statement said. DACA, the Deferred Action for Childhood Arrivals program, began as an executive order issued under President Barack Obama which instructed federal agencies not to seek the deportation of certain illegal immigrants who had arrived to the country as children and who otherwise met certain criteria. Several weeks ago, Trump announced that he would be phasing out DACA over the next six months. At the time, Trump signaled that he was seeking a Congressional enshrining of the executive order into law in a tweet. "Congress now has 6 months to legalize DACA (something the Obama Administration was unable to do). If they can't, I will revisit this issue!" he wrote. The next day, Trump also tweeted a reassurance to DACA recipients that they would not be deported in the six month transition period, a tweet that reports subsequently revealed he was encouraged to send by Pelosi. The deal, should it stick, is significant as the second time in recent week that Trump has reached across the aisle, to the exclusion of his Republican colleagues in the House and Senate. Last week, Trump struck a deal with Pelosi and Schumer to raise the debt ceiling over the objections of House Speaker Paul Ryan (R., Wisc.) and Senate Majority Leader Mitch McConnell (R., Ky.). Neither Ryan nor McConnell were in the room at the dinner Wednesday night. It is not yet known whether they have assented to the deal, or were aware of it ahead of time. UPDATED 10:31 P.M.: This post was updated to reflect statements from the White House and Press Secretary Sarah Huckabee Sanders. This entry was posted in Politics and tagged Chuck Schumer, Donald Trump, Illegal Immigration, Nancy Pelosi. Bookmark the permalink.